Western blot analysis of extracts from HeLa, NIH/3T3 and C6 cells, using p38α MAPK (L53F8) Mouse mAb. 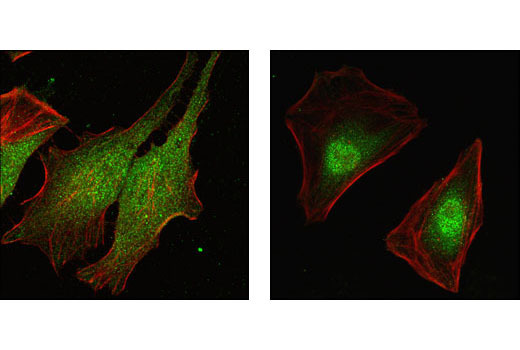 Confocal immunofluorescent analysis of HeLa cells, untreated (left) or anisomycin-treated (right), using p38-alpha MAPK (L53F8) Mouse mAb (green). Actin filaments have been labeled with Alexa Fluor® 555 phalloidin (red). 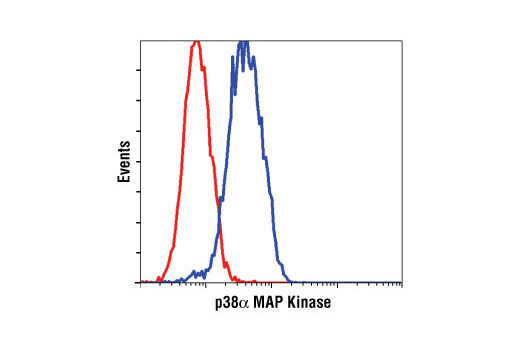 Flow cytometric analysis of Jurkat cells, using p38α MAPK (L53F8) Mouse mAb (blue) compared to a nonspecifc negative control antibody (red). 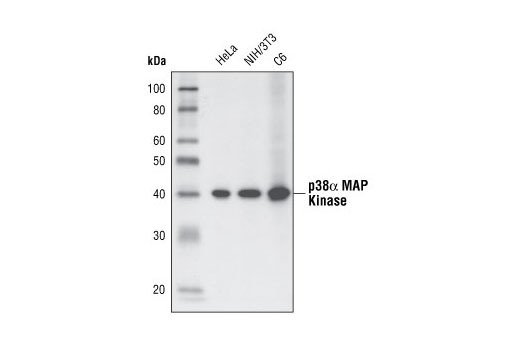 p38α MAP Kinase (L53F8) Mouse mAb detects endogenous levels of total p38α MAPK. This antibody does not cross-react with either JNK/SAPK or p42/44 MAPK or other isoforms of p38. Monoclonal antibody is produced by immunizing animals with a recombinant p38 MAPK protein.